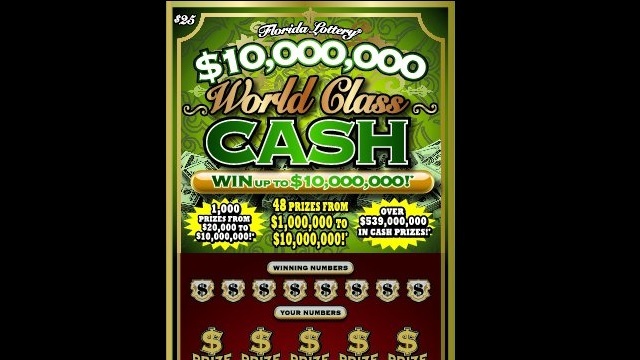 BREVARD COUNTY, Florida - JonDavid Duvall, of Viera, Florida, claimed a $1 million prize from the $10,000,000 WORLD CLASS CASH Scratch-Off game at Florida Lottery Headquarters in Tallahassee on his 48th birthday. He chose to receive his winnings as a one-time, lump-sum payment of $748,000.00. Duvall purchased his winning ticket from a Publix supermarket located at 5380 Stadium Parkway in Viera. The retailer will receive a $2,000 bonus commission for selling the winning Scratch-Off ticket. The chances of winning a $1 million prize are 1-in-620,870. The new $25 game, $10,000,000 WORLD CLASS CASH, launched in February and features more than $549 million in total cash prizes, including two top prizes of $10 million and 46 prizes of $1 million. Overall odds of winning are one-in-2.89.